In some severe cases, varicose veins can lead to blot clots. Varicose veins are blue, bulging and twisted-looking veins that can be seen from the surface of the skin. Individuals with varicose veins may also experience leg fatigue or heaviness, and leg cramps at night. Varicose veins are a symptom of chronic venous insufficiency (CVI), and will generally present in the later stages of the vein disease. When blood collects in the legs and creates pressure for an extended length of time, the pressure will stretch the vein walls and damage the vein valves responsible for returning blood to the heart. Over time, this phenomenon causes the veins to swell and bulge. Chronic venous insufficiency and varicose veins are more common in women over the age of 50 or individuals like EMS workers, retail professionals, teachers and food service employees who spend most of their time on their feet. A family history of CVI, obesity, high blood pressure or a sedentary lifestyle will also increase the odds for developing the condition. 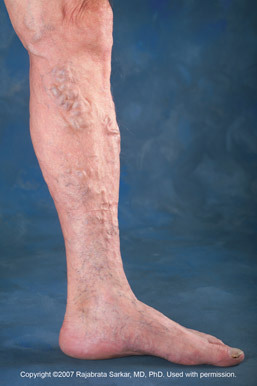 In severe cases, varicose veins can lead to deep vein thrombosis (blot clots). Your doctor may advise you to wear compression stockings to increase circulation in the legs and prevent blood from pooling. Elevating the feet for 15 to 30 minutes several times a day may also be recommended to help relieve pressure but ideally, the chronic venous insufficiency condition must be treated to correct varicose veins. Ultrasound guided sclerotherapy, ambulatory phlebectomy or endovenous radiofrequency ablation (RFA) are highly effective, minimally invasive procedures that are most commonly used to treat both conditions. If you have varicose veins and believe they may be related to CVI, contact us today to schedule a consultation.